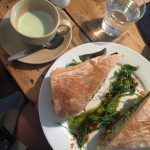 One of the best things about living in Falmouth is the incredible amount of cute little independent cafés and restaurants. 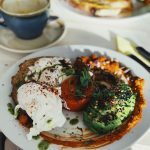 If you are a foodie or coffee lover, Falmouth will definitely not disappoint. 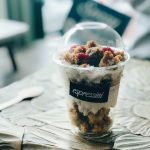 There is everything from artisan coffee shops, cute bakeries, cafés of all different cuisines, restaurants with a sea view and of course the best pasties you can get your hands on! 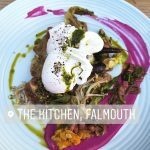 So here’s my definitive guide to Falmouth’s Food Scene, hope you enjoy! 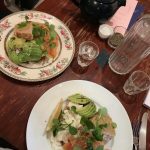 Good Vibes Café: So this place is my absolute go-to breakfast and lunch spot! 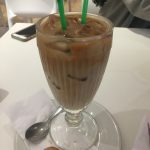 It’s a really nice atmosphere to go for a coffee or study session with friends or breakfast/lunch when you are out in town. 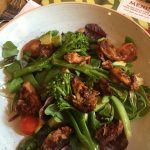 Everything is cooked fresh and the menu changes throughout the year so there is always something to try! 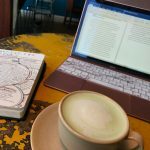 How perfect is this study sesh set up!? 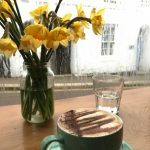 Espressini: Another one of my favourite places in Falmouth. 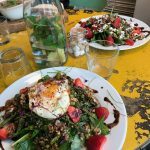 Located just along Killigrew Street, this adorable shabby-chic inspired cafe is not only another lovely place to come study, but a must-try brunch and coffee spot! 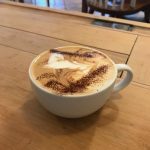 They have been awarded to have the ‘Best Coffee in the South West’ so give it a try whilst in town! Taking my Coconut Yogurt Parfait with me to lectures! 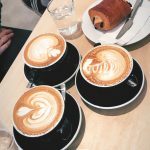 Espressini has award-winning coffee so don’t miss out! Fuel: This was one of the first places I ate at in Falmouth, and it is also one of the few that stays open quite late in the evening. It also has two massively comfortable sofas and board games to play if you fancy hiding out during a rainy day. 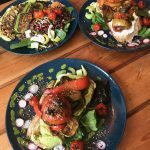 How yummy do these salads look?! 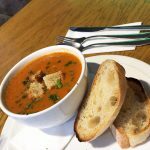 Tomato Basil Soup for a Cold Winter Day! Amanzi: Fancy some African cuisine for dinner? 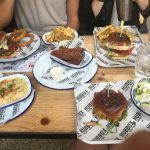 Head over to Amanzi (although try and book a reservation because it fills up very quickly) for incredible and insta-worthy food and some funky drinks! Chain Locker: One of the BEST views of the harbour and an excellent nautical feel greets you when you step into Chain Locker. 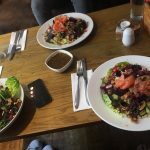 They have a really nice pub on the ground floor and a wonderful restaurant upstairs with delicious burgers, salads, and little dishes to ease a craving or two. How nice does this cappuccino look!? 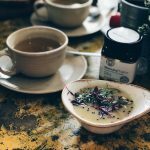 The Ope: This cute little cafe is located on the Old High Street just past Hand Bar and Stones Bakery. 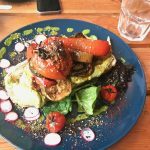 If you’re into healthy and wholesome foods and are looking for vegan and vegetarian options- this is your place! 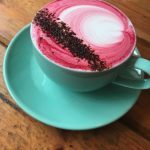 Make sure to try a Beetroot Latte or Dirty Chai Latte when you go, they are absolutely incredible! Kitchen: Just next to Chintz and Hand Bar in the little courtyard, sits the Kitchen. 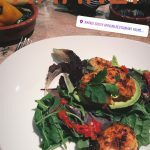 While there is no seating inside and not really a menu with options to choose from, the chef will never disappoint in his creations inspired by local and organic produce that is in season. It is also one of the nicest places in Falmouth to go for a peaceful atmosphere to read or get some work done. 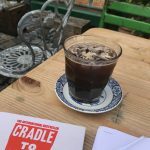 Iced Coffee to keep me fuelled through my revision sesh! 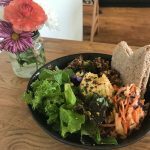 Wild Vibes: Created by the minds behind Good Vibes Cafe in the Moor, Wild Vibes sits atop Argal Lake in Penryn. With incredible brunches and beautiful views its hard to say no to this place! You can even take a stroll down to the lake after your meal and admire the landscapes up close. 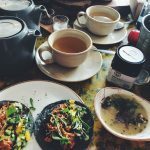 How yum is this brunch!? 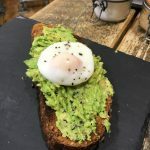 Picnic: One of the best places for Avocado Toast and delicious coffee – Picnic is well-known around Falmouth for its cozy atmosphere and good quality coffee and food. It is on the high street so next time you are walking through town, stop by Picnic! 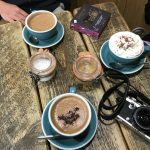 Mocha, Cappuccino, and a Rich & Creamy Hot Choc! 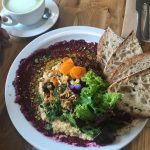 The Natural Store: I am starting to realise that while this post is really concentrated on healthy/vegan restaurants in town, it is truly on of Falmouth’s specialities. 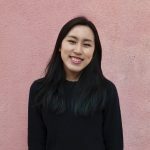 I am not vegan or vegetarian, but the food at all of these cafés are so delicious that I find myself ordering the vegan options anyways! The Natural Store is as the name suggests, your one stop shop for organic fruit & veg and healthy snacks and foodstuff. Upstairs is a cute cafe with a wonderful view of the pier and nice big tables to get some work done on. 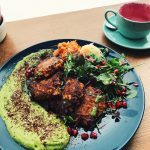 It is a vegan restaurant, but definitely not one to miss out on! 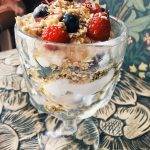 Gylly Beach Café: The ultimate place to hang out in Falmouth in my opinion is Gylly Beach Café. 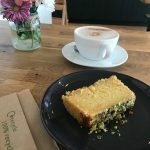 It is the only restaurant that sits on our beautiful local beach and I go there most days with friends to have coffees, cakes, drinks, and even meals! They do really nice roasts as well on Sunday and have live music on select evenings each week. Make sure to sit out on the deck outside (even when the weather is cold, they have heating and blankets outdoors!). 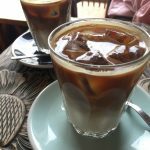 Origin Warehouse: Located in Penryn, Origin is one of our newest arrivals to the area, and oh boy is it something special! 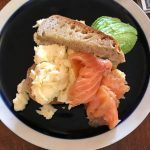 Culinary perfection in every sense of the matter and a really nice set up to go with friends for breakfast/lunch/brunch. 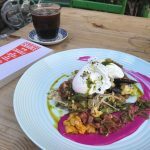 one of the most aesthetically pleasing and tasty breakfasts I’ve ever had WOWEEE! 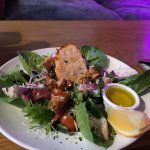 Fives: You will get to know Fives on nights out, but did you know they also have a restaurant upstairs that does everything from salads to burgers, to drinks and more? 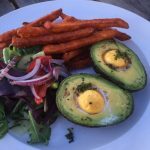 They have really nice sweet potato fries- 10/10 recommend! 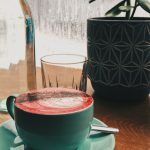 Chintz: There is no way to describe this uniquely arty and near psychedelic looking bar and restaurant located in the same courtyard off the Old High Street as Hand Bar and The Kitchen. Every corner and inch of the walls are covered in random items like dolls, posters, old toys and art pieces to clothing articles etc… They are usually open until 11pm and have several fun live performers that come in every week. 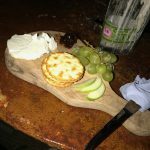 If you fancy and charming evening with of wine and cheese alongside some music, look no further. 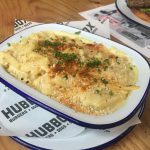 Hubbox: While it is out in Truro, Hubbox is THE place if you fancy a burger and some INCREDIBLE Mac’n’Cheese. The milkshakes here are also a MUST. Definitely a fun ‘Cheat Day’ stop to hit with your mates. 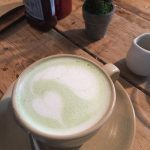 The Idle Rocks: Not your everyday restaurant, but not one to miss! 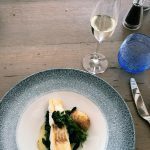 I would 100% recommend paying a visit to The Idle Rocks just across the water in St. Mawes if you are wanting to go for a nice meal with parents or on a special occasion. 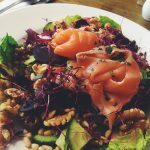 If you take the ferry leaving from Falmouth Pier out to St. Mawes, you will enjoy a tasteful meal paired with breathtaking views atop the water. Palacio Lounge: One of the restaurants in Falmouth that stays open a bit later is Palacio Lounge. 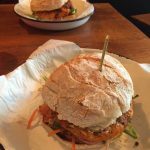 They serve breakfast all day and everything from salads to cheat day meals like Mac & Cheese, tapas, and loaded burgers. 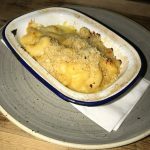 As one of the biggest Mac & Cheese fanatics ever, trust me when I say this Mac & Cheese is one of the best I’ve tasted so be sure to order it when you go! 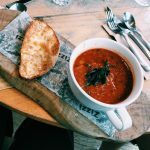 Zizzi: Not necessarily a foodie place, but definitely a great spot for catching student deals and delicious pizza, soups, and salads. It’s also located on the waterfront of the harbour, so it overlooks all the pretty boats sitting in the water. 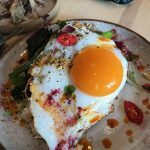 I really hope you have enjoyed this list of restaurants and cafés to go to while living out in Penryn and/or Falmouth over your time here at Penryn Campus. Trust me when I say this is only a small fraction of all the amazing places to get some grub out in town. Disclaimer: These are views of current students and they do not represent the view of the University in any way.